Despite dozens of visits to Maui, I had never ventured to Haleakala for sunrise. Since I usually stay in West Maui, the thought of rising at 3:00 a.m. or earlier and driving two hours up a curving mountain road in the dark never appealed to me. Then, the Maui Visitors Bureau folks arranged for a group of visiting writers to join them on a trip to the 9,740 ft. visitor center area of Haleakala for sunrise. While it still meant getting up at 3:00 a.m., at least I got to ride in mini-bus and sleep most of the way. Knowing how cold the summit of Haleakala can be in the daytime, I was prepared with my thermals and several layers of clothes. While it was cold at the visitor center overlooking the "crater," it was much warmer than I expected. Someone mentioned it was about 40 degrees. I was prepared for much worse. We were lucky on this early pre-dawn morning. Even almost an hour before sunrise, there is light where about a hundred people had gathered to welcome the day. The colors of the sky as actual sunrise approached were amazing. In this instance a somewhat cloudy day means more color. Arriving a while before sunrise is essential. The time allows you time for contemplation and to just appreciate what stands before you. First time visitors can only wonder what lies in the "crater" in front and beneath them. Long before the days of written history when the ancient gods walked the earth and fished the seas, the Demigod Maui was called before his mother, the goddess Hina. The goddess complained that the sun moved across the sky so fast every day that her tapa cloth would not dry. Wanting to please his mother, Maui, who was known for his tricks, devised a plan to solve his mother's problem. Climbing to the summit of the great mountain before dawn, Maui waited for the sun to peek its head above the edge of the horizon. When it did so, Maui took his lasso and lassoed the sun, stopping its path across the sky. The sun begged Maui to let it go and proceed in its path across the sky. Maui agreed on one condition. The sun must agree to slow its path across the sky and allow more time for light during the day. The sun agreed. In ancient times the summit of the great mountain was only for the kahuna (priests) and their haumana (students) where they lived and studied initiation rites and practices. "In ancient times the Kahuna po`o (high priests) knew the value of Haleakala as a place to view the planets and the stars, and as a place for meditation and receiving spiritual wisdom. Haleakala is a sacred place and must be treated with respect." - Kahu Charles Kauluwehi Maxwell Sr. In recent times, this sacred place has been challenged by modern man. The University of Hawaii's Institute for Astronomy, often referred to as Science City, while consistent with the ancient traditions of viewing the planets and stars from the mountain's summit, has not been without controversy and opposition. More controversial has been the ever-increasing number of tourists that make their way up the mountain, in many cases with little regard for or knowledge of the sacred nature of the mountain and the mountain's delicate eco-system. For years, the numerous commercial bicycle tours which began their decent from the parking area of the Haleakala Visitor Center were a prime target of those who respect the mountain. Fortunately the National Park has curtailed their activity within the park boundaries for safety reasons. On this day the mele oli (free verse chanted poetry) was performed by a National Park ranger, but it could have easily been done hundreds of years ago by a revered kahuna. 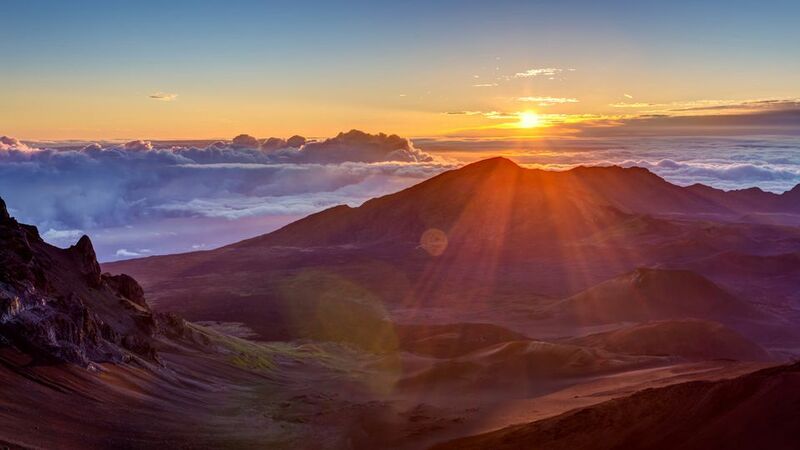 As the sun rose above the distant mountain edge, the sun began to shine into the "crater" and the majesty that makes Haleakala such a wonderful sight to behold slowly comes into view. Much too soon it was time for our group to begin our descent down the mountain. If possible arrange to see sunrise with a tour group where a professional driver will take you to the summit. If that is not practical, make sure you get up early enough to plan your arrival at the Visitor Center at least 30 minutes before sunrise. Remember that your park admission is valid for 3 days including the date of purchase. This will allow you time to return on another day for great mid-day views into the crater or even sunset. Dress warmly, ideally in layers. By the time you reach the bottom of the mountain after sunrise, the temperature may be much warmer. Bring your camera. I was surprised how many people were taking flash pictures of the sunrise. They won't turn out. You'll have much better results without the flash. Only use your flash in the dark if you're taking a photo of a person or nearby object. Otherwise it is simply a distraction to others. Keep your voice down. For many this is a very special experience. When the mele oli is chanted please keep silent. Be respectful of the place. Do not walk where you are not allowed to walk. Do no damage to the eco-system either at the summit or anywhere on the mountain. Always remember that you are a guest in this sacred place. Read our detailed feature on the Haleakala National Park Summit Area and view a gallery of 48 photos of Haleakala National Park.